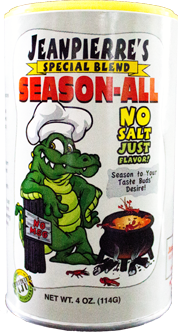 Jeanpierre's perfect blend of spices gives your foods a great cajun flavor without all the salt. Try to find the salt hidden in the flavor! Jeanpierre's perfect blend of spices gives your foods a great cajun flavor without all the salt. So season to your taste buds' desire! Jeanpierre Family Spices is devoted to conducting our business in an ethical and socially responsible manner. We are committed to high quality and healthy spices. Jeanpierre Family Spices’ dedication to wellness means supporting policies and efforts to improve the health of our communities, as well as offering a lower sodium alternative to our customers. We aim to decrease the impact on the environment by reducing, reusing, and recycling when possible.